Park Ridge Community Women is a social and philanthropic organization committed to improving the quality of life in our local community. We offer philanthropic, fundraising and social activities to our members. Park Ridge Community Women supports local community organizations and charities throughout the year with participation from our members and their families in philanthropic activities. These have included making lunches for the needy, providing volunteers for service projects, and collecting items for homeless shelters. Park Ridge Community Women holds a fundraiser periodically with the proceeds going toward a local recipient or charity selected by our members. Recent fundraisers have benefited local residents hit by illness or other sudden crises, brain aneurysm research, and Gigi's Playhouse, which provides support services to individuals with Down's Syndrome and their families. Additional fundraising is done at other times of the years, including our annual summer raffle to raise money to support the free Concerts in the Park. General meetings during the programming year offer opportunities for members to meet new people, learn about new local establishments, and have fun. PRCW also offers social activities that include members' spouses and children, such as, couples game night, gourmet dinners, and our annual cupcake decorating competition. In 2015, Park Ridge Community Women celebrated 60 years as a philanthropic and social organization. The organization started in 1955 as the Park Ridge Chamber Maids with the goal of raising funds for a local charity. The name changed to the Park Ridge Jaycees Women's Club in the early 1960s and then to PRCW in 1984. Regardless of the name, the goal has not changed: to improve life in our community. 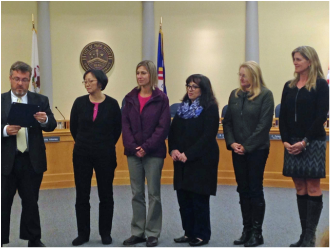 On November 16, 2015, PRCW was recognized by the City of Park Ridge for our 60 years of philanthropy and community service. We are grateful for this honor! Marty Maloney, Acting Mayor of Park Ridge, reading a resolution recognizing PRCW's 60 years of philanthropy and community service with current and past PRCW presidents and board members. PRCW is a 501(c)(4) organization. Donations and contributions to 501(c)(4) organizations generally are not deductible as charitable contributions for federal income tax purposes. They may be deductible as trade or business expenses, if ordinary and necessary in the conduct of the taxpayer’s business. Additionally, IRS rulings state contributions by individuals, made to specific individuals, are not deductible for federal income tax purposes. Donors should under no circumstances rely upon this information as a substitute for obtaining specific tax advice from their own professional legal or tax advisers.